Hello Friends! How are you all? I am doing good. Keeping busy around the house, with work and trying to get ready for Christmas. I can’t believe it will be here next week! December has flown by! I am almost done with my shopping, what about you? 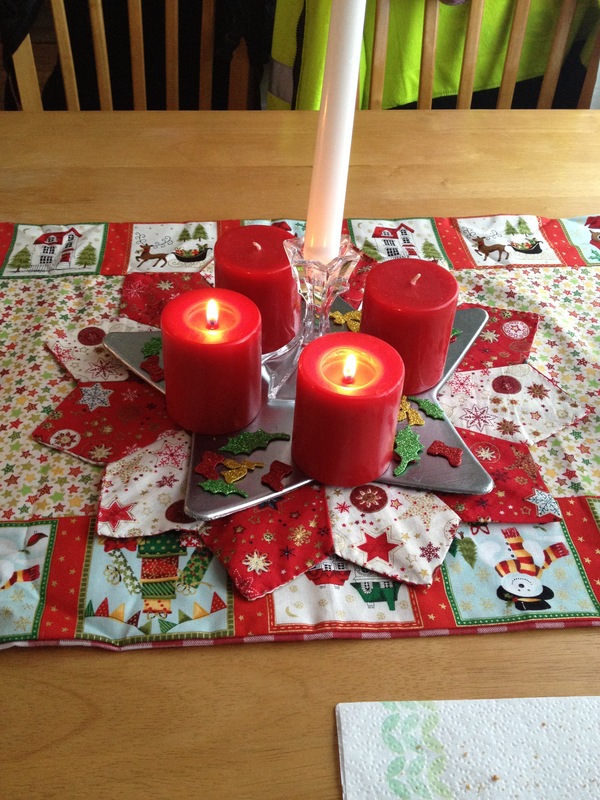 Decorating the house is like half done, I know…I am slacking! But I did remember my favorite thing for the season. My Advent candles. I took this picture this past Saturday so it still only has two candles lit. I am always scrambling days before or on the day of to find the right candles but I always make sure it is set up and ready. I love sitting at the table with my candles lit and just the whole set up. It’s a comforting feeling. Is there anything about this time that you really look forward to? 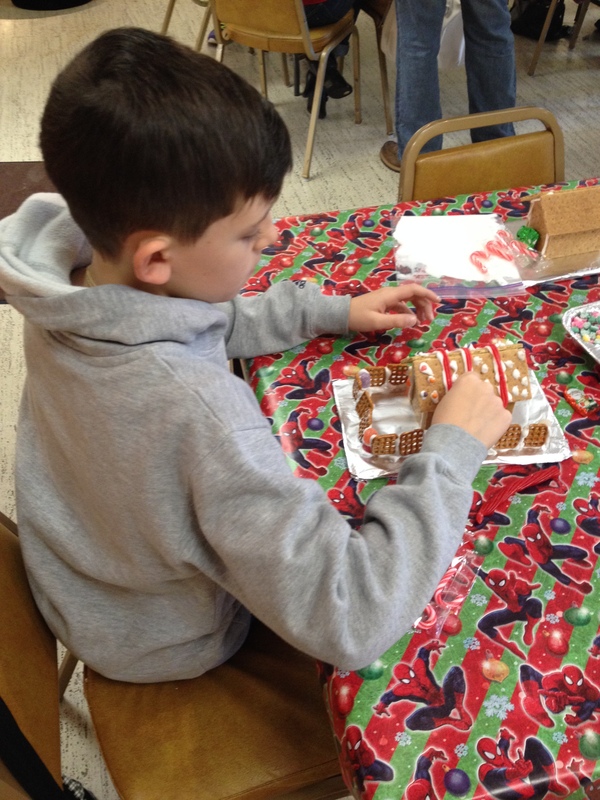 Last Saturday we also went to our library because they had an activity for kids to decorate gingerbread houses. Little Man had fun working on his and coming up with ideas. I helped a bit with the fence but other than that he pretty much did it on his own. I also had my work Christmas party Saturday Evening. It didn’t go quite as planned. Both of our bosses called a friend I work with and said they were sick and couldn’t make it, just a couple of hours before it started. They had all the food and supplies for the party so my friend scrambled to get some snacks and salad stuff. My one boss ordered some pizza to be delivered to the hall where we had the party but he only ordered seven pizzas for almost 50 people, so she had to order more. Apart from that it was nice to hang out with some of the ladies outside of work. Have any of you had any Christmas parties already? 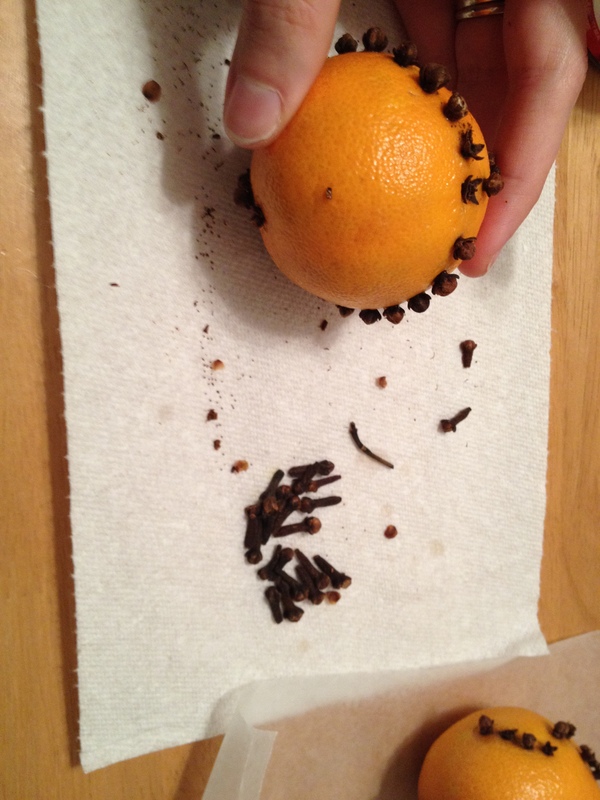 Yesterday my mom gave me a bunch of oranges so I decided to make a clove orange today while I was working on dinner. I forgot to get a picture of it done. I didn’t do a special pattern I just covered it all over with cloves. I will get a picture of it hanging up and all done. My mom used to have one hanging in our hallway for a long time and it smelled so good and lasted a really long time. I hope mine does too. Tomorrow I am planning on finishing my tree. It has lights and a few ornaments that I have bought and that my grandma sent me. So hopefully I am successful! I am so behind this year!… All because of the flu, I am still sick and weak, and I don’t have anything ready apart from the presents. Anyway, we go to my parents for Christmas so I don’t really have to prepare anything. I like your Advent candles! My apartment is so small that we don’t really have space for decorations or a tree, maybe I’ll buy a small one and put it on a windowsill.